PLOT SUMMARY: Jessica Tran is the daughter of C-list superheroes, but she doesn't have C-list powers. To be precise, she doesn't have powers at all. She's disappointed, but is trying to get used to the fact that she'll never be a hero like her parents and sister, and instead focuses on beefing up her college apps. Jess is elated when she stumbles across the perfect internship, but is shocked when she finds out it's a front for the dealings of two of the cities' supervillains... her parents' archenemies. Still, though, Jess sees an opportunity. Specifically, she looks at the situation and can't help but think, "Oh, this will be hilarious." As a nice bonus, she even gets to spend some time with her secret crush, Abby. But, as one may expect, things get real in short order, and Jess finds herself and Abby in quite a bind... and the superheroes can't save them now. FIRST THOUGHTS: This book has been on my TBR list forever, so I'm glad to have finally gotten to it! I've heard lots of great things about it, but the main draw was the promise of a queer superhero story. Who doesn't want to read that? While I found the beginning to be a bit bumpy, I really, really enjoyed this book, and I think a lot of my friends would, too. I hope this book paves the way for more diverse YA fiction -- especially involving superheroes, because, screw it, I love superheroes. They're the best. THOUGHTS ON CHARACTERS: I love Jess. She's simply wonderful; she's funny, smart, capable, awkward, endearing, and good to her core. She also displayed a remarkable amount of character development for a relatively short book, and really grows as a person. Despite her unusual setting, she felt very much like a real teenage girl, especially in scenes she shares with Abby, the girl she has a crush on. Speaking of which, the romance between Abby and Jess was simply adorable. I was grinning from ear-to-ear when I was reading some of their scenes, and it was the rare romantic subplot that actually deepens the characters. The side characters were great, too, especially M, Abby and Jess' boss at their internship, Jess' superhero parents, and her friends Bells and Emma. Jess and Abby definitely steal the show, but the supporting cast is very well-rounded, and serve as great foils and comparisons to our two leading ladies. THOUGHTS ON POLITICAL STUFF: YESSSSSSSS. What sparked my interest in this book was that the lead character is a bisexual girl of color, and when I actually began reading, I was delighted to find that that was far from the only representation. There are multiple queer characters, multiple POC, and, with the exception of Jess' friend Bells, all the major players are women. None of the minority characters are stereotyped or one-dimensional caricatures; even the minor characters are fleshed out and human. We need more books like this; books that have multiple minority characters, rather than one or two tokens, and books where the diversity doesn't serve any "narrative purpose," it's just there because, well... that's how life works! The world is not male, cis, straight, and white, so why should all our books be? FINAL THOUGHTS: This was a fun, cute read, and I'm glad I gave it a shot after hearing so many people gush about it. I'm not sure whether or not I'm going to continue on with the series yet, but I have the first sequel, Not Your Villain, on my "to-read" shelf on Goodreads, so we'll see. I would love to see a movie or TV adaptation of this book; I think it'd work really well in live-action. Overall, it was well worth the time it took to read it, and I hope more people discover it very, very soon. 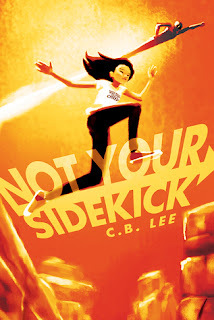 If you've read Not Your Sidekick, I'd love to hear your thoughts in the comments below!